I operate a hotel and have a large donation of furniture I’d like to make to Bridging. How do I make arrangements? Please send an email to Jim@BridgingAZ.org and provide your contact information. Does Bridging sell donated furniture? Yes. In some cases, we will accept items that may not go directly to furnish apartments. We sell or trade up to 20 percent of our inventory to support our operations and buy furniture that is in short supply. Will you take items not on the “YES” list? In rare circumstances. Our schedulers and drivers do have the discretion to pick up additional items IF they can help our mission — and if we have room in the truck! 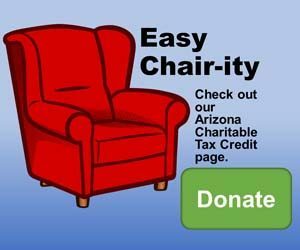 Are my furniture donations tax deductible? How much can I deduct? Yes, Bridging is a nonprofit under section 501(c)(3) of the federal tax code and donations are tax deductible. However, Bridging cannot determine the value of a donation of items such as furniture. The IRS offers guidance on determining values in Publication 561. You can also check with your tax professional.